Frankie Doodle Dandy wishes you a happy Independence Day. Sitting on a blanket of American cheese, he rides in on a toasted English. He’s a Swift Premium Frank. All-American. All-delicious. He’s made with delicious cuts of meat. But not a speck of filler. And all the pizazz of the Fourth of July. In Regular or Beef. 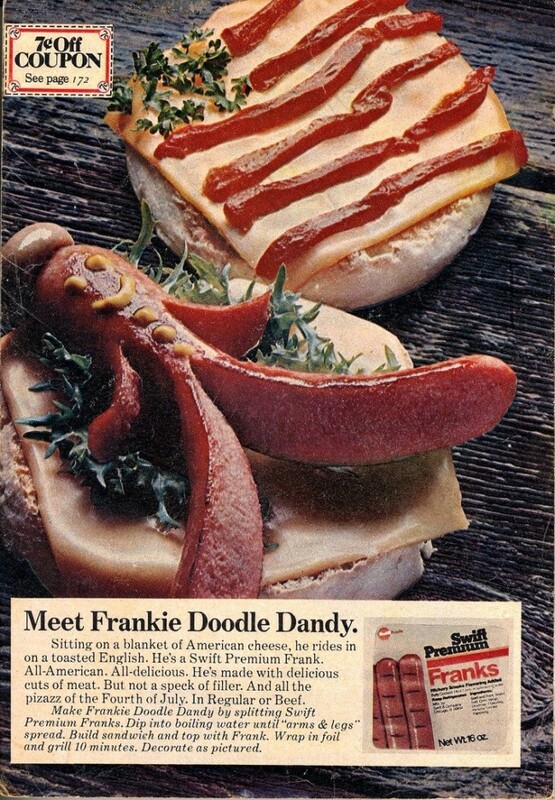 Make Frankie Doodle Dandy by splitting Swift Premium Franks. Dip into boiling water until “arm & legs” spread. Build sandwich and top with frank. Wrap in foil and grill for 10 minutes. Decorate as pictured.